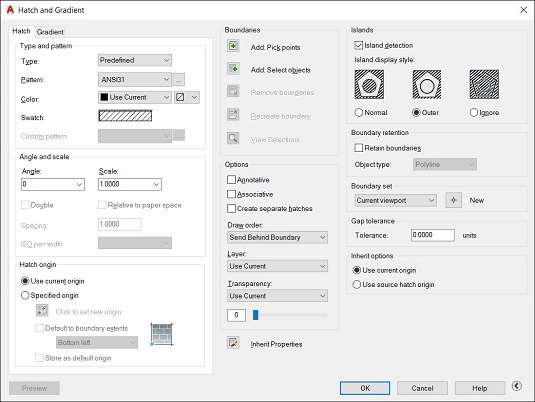 You can use predefined, user-defined, or custom hatch patterns in AutoCAD. Most of the time, you’ll choose predefined hatch patterns unless some generous soul gives you a custom pattern. On the other hand, unusual to use a user-defined pattern because hatches consist solely of continuous lines. All you can define are the spacing and rotation angle and whether the lines are parallel pairs. And all this can be duplicated with standard patterns. An alternative to using the Ribbon to create the pattern is the Hatch and Gradient dialog box. You don’t see the hatch object updating as you change settings (as on the Ribbon), but you have more control over what you end up with. To display the Hatch and Gradient dialog box, click the dialog box launcher (the tiny arrow at the right end of the Options panel on the Hatch Creation tab of the Ribbon). The Hatch tab in the expanded Hatch and Gradient dialog box. By default, the right third of the Hatch and Gradient dialog box is hidden; to see additional hatch options at the right side of the dialog box, click the More Options arrow beside the Help button. To use predefined hatch patterns in AutoCAD, select Predefined from the Type drop-down list at the top of the Hatch tab in the Hatch and Gradient dialog box. This selection sets the stage for choosing the hatch pattern. Pattern drop-down list: If you know the name of the hatch pattern, select it from the Pattern drop-down list. The list is alphabetical, except that SOLID (that is, a solid fill) appears at the beginning. Pattern button: If you don’t know the pattern name or if you prefer the visual approach, click the Pattern button to display the Hatch Pattern palette with pattern previews and names. The Pattern button is the tiny button with the ellipsis (three dots) to the right of the Pattern drop-down list and pattern name. 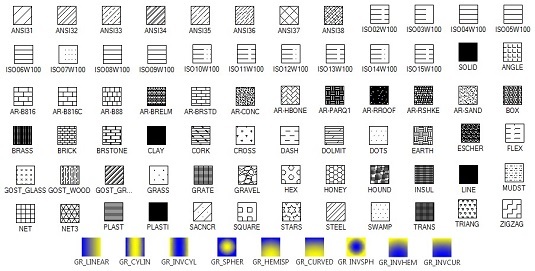 Here are more predefined hatch patterns, which cover everything from earth to Escher to stars. A veritable plethora of hatch patterns. AutoCAD treats filling an area with a solid color as a type of hatch. Simply choose SOLID from the top of the Pattern drop-down list. You also see several gradient-fill options, where one color gradually changes to another. Like any other object, a solid hatch takes on the current layer’s color if you leave (as you should) the color set to ByLayer, or it takes on the current object color override if someone else who doesn’t know what they’re doing has altered the drawing. Therefore, check whether the current object layer and color are set appropriately before you use the Solid hatches option. The transparency object property in AutoCAD is probably most useful (in 2D, anyway) when applied to solid fills. You can use transparent solid fills to demarcate (distinguish) areas on architectural floor plans or aerial photographs of project sites. In addition to ByLater and Solid settings, make sure that the current object or layer transparency is set correctly, too.